To ancient civilizations, birds were harbingers of the seasons, winged soothsayers, even messengers from the underworld, sent above to sow death among the living. These days, we may have a more complete biological and ecological understanding of our avian planet-mates, but observing the rhythms and habits of birds can still engender lyrical musings, especially at the hand of British naturalist John Lister-Kaye. In Gods of the Morning, Lister-Kaye distills his three-decade-long residence in idyllic Aigas, the impressive, centuries-old hunting lodge and grounds where he founded Scotland’s first field studies center. There, the author communed with nature, with birds—blackcaps, ospreys, swans, and tawny owls among them—as his inspiration. “Birds have been at the heart of my work and my life,” he writes. “So much more visible than mammals, they are my gods of the morning, lifting our days with song and character.” Even more importantly, birds have served as Lister-Kaye’s “thermometers of environmental health and change.” As some species disappeared and others returned from the brink of local extinction, the naturalist recorded these comings and goings and the impacts they had on the landscape. We may be in the midst of bikini season, but the excesses of the holidays are right around the corner. And nothing is held to be more festive, at least in the U.S., than wolfing down copious amounts of food and drink. It may be a good time to consider exactly what drives modern humans to overconsume even when good sense and good science dictate otherwise. 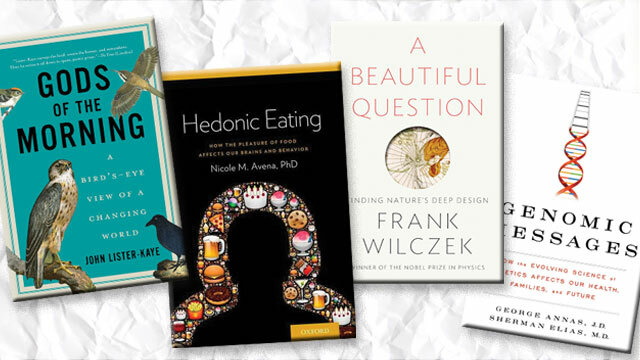 In Hedonic Eating, Nicole Avena, a neuroscientist now at Columbia University’s New York Obesity Research Center, and a host of other researchers dissect the urge to stuff our faces for pleasure rather than solely for sustenance, bringing to bear the latest research in psychology, neurology, and behavioral science to arrive at answers. Our bodies’ biological propensity to seek out sugar, fat, and calorie-rich foods, the neural circuitry that rewards us for scoring such treats, and the neurological similarities between overeating and drug addiction are all discussed in this enlightening foray into human nature. Too often, science is characterized strictly as a quest to uncover facts or truth. To Nobel Prize–winning physicist Frank Wilczek, using scientific inquiry as a tool to crack open the mysteries of nature is all about beauty. From ancient Greek philosophers such as Pythagoras to paragons of modern theoretical physics such as Einstein and Maxwell, the more we learn about the natural world—the subatomic and cosmological landscapes alike—the more beauty we uncover. Symmetry is the embodiment of beauty, according to Wilczek, and his own research into “supersymmetry,” which predicts the behavior of subatomic particles that have only recently been discovered, has the potential to resolve some of the key enigmas inherent in particle physics. “Does the world embody beautiful ideas?” That is the question that launches the book. The answer leads readers on a tour of theoretical physics and the natural world that is as aesthetically pleasing as it is mind-expanding. Bioethicist George Annas and the late clinical geneticist Sherman Elias teamed up to chart the increasingly rapid translation of genomic advances into clinical relevance in Genomic Messages. The duo considers the ethical, medical, and social ramifications of the rapid advancement of genomic technologies as these methods change the way we think about basic biology, medicine, and health. Through telling the stories of actual patients, Annas and Elias identify the key issues that need addressing as we advance toward a future where genomics will be commonplace in clinical care and precision medicine will be known as just medicine. Correction (August 7): The original version of this article mistakenly mentioned black-capped chicadees in the review of Gods of the Morning. That species does not inhabit Scotland, but the blackcap (Sylvia atricapilla) certainly does. That review has been corrected. The Scientist regrets the error.